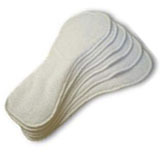 Boosters are used to add absorbency, but sometimes may be referred to as booster liners. 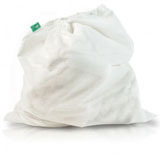 Liners are used to line the nappy, usually to collect poo (biodegradable flushable) but may also be used to keep baby dry (fleece or polyester) or protect baby's skin (silk). Just to confuse further, there are also hybrid boosters with both an absorbency and a liner function such as the Twooster (2 layers of terry topped with 1 laye of fleece). Different manufacturers booster pads vary in size, please note that the measurements given are only approximate, and that composition may change. It is worth mentioning that ANY absorbent fabric you have may be used as a booster, you do not necessarily need to buy a matching booster for your nappy, you'll achieve the same effect with a cut up towel or old flannel folded in two: experiment to find the absorbency you need for your baby. Do experiment with the number of booster pads you need especially where you are looking for a nappy that will last through the night. Boosters can be laid flat in the nappy or folded to give the extra padding where required - more at the front for a boy and to the back for a girl. For extremely heavy wetters you may find that a prefold folded into a pad will be more absorbent than boosters, or alternatively use two nappies. You will find that these extra layers may well mean you need a larger wrap. For best effeciveness when adding a lot of extra boosters, add these between nappy and the wrap - too many layers inside the nappy can result in the elastic pulling away at the legs encouragng leaks. If you place the booster between nappy and wrap the nest result is the nappy is pushed closer to baby, thus ecouraging a more immediate soak-up by the nappy. 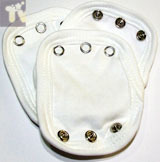 All booster pads can be washed with the nappies. LINERS are used to provide a drier layer between baby and the absorbent nappy and / or to aid with poo removal, or to treat nappy rash. With all these liners there is no 'right' way up, either way up will do. 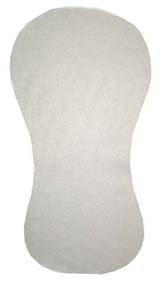 Polyester Fleece liners provide a stay-dry layer between nappy and baby. Fleece isn't absorbent, and thus any solid matter will remain on the liner, the mositure will evaporate through (using baby's body heat) to the absorbent nappy underneath, leaving the polyester fleece as a dry layer between baby and nappy. 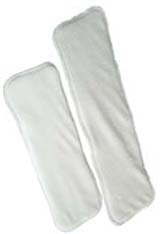 If you are using a fleece liner there is no need to also use a disposable liner - poo usually falls off polyester fleece quite easily - hold over loo and shake carefully whilst stretching it, or hold a corner and flush the loo. For a newborn, particularly if breastfed it's perfectly acceptable to pop the whole lot in the wash, as there won't be much solid matter. If you use both fleece and disposable, the stay-dry properties of the fleece may be lost as the two don't appear to work together as sometimes a layer of moisture may be trapped between the two leaving the flushable liner soggy. However with older babies and toddlers, when poo cycles are more regular and in larger quantities, you can lay a disposable liner over the fleece when expecting a poo to make poo removal easier, particularly when out and about. Again, this is something you can experiment with. 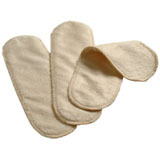 The same thing happens if you are using silk liners, which are useful for treating nappy rash. 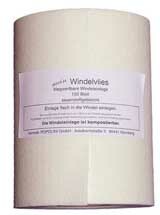 The soothing effect of the silk will get lost if a paper liner is used on top, likewise these shouldn't be used in conjunction with barrier creams. However silver polyester liners, which are also used for treating nappy rash seem to work wherever they're placed in a nappy, the antibacterial properties of silver seem to work well whether next to baby or under another liner.